I’ve been in the pose every day this week as a way to counter the low back compression I’ve experienced from gardening. Part of why the pose is so good for the lower back and sacrum is because it stretches the abdominal area, a part of your body that tenses when your back is tight. That’s going to be good for your digestion, too. 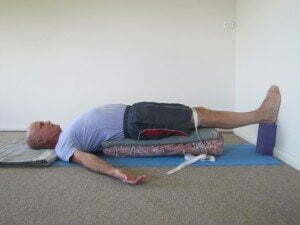 Another great advantage is that the pose is soothing for the nervous system. You know how stressed you start to feel when your back has been sore for some time. This pose can calm your mind, as well as helping to reduce nervous exhaustion. Use a belt on your thighs to keep them internally rotated. If there’s any discomfort in your lower back, try tucking your buttocks under and/or having your feet a little higher at the wall.